We are sad to announce that ASHEM CRAFTS is finally closing down. Unfortunately this is due to old age and ill health. We would like to thank all our valued customers for their support and patience and for their generous, positive comments about our tools. It has been a pleasure to serve you all. One of our sons may take over the business but not for a few years to come. We do have some chair-making equipment for sale. These include formers for bending bows, stainless steel straps, windless, steamers, various jigs for drilling angles and more. If anyone is interested, please get in touch. Ashem Crafts are makers of Rotary Planes and allied equipment, essential tools for chair makers wishing to make Windsor or Shaker style chairs. Individually hand made to a very high standard. The accuracy of the rounders make them ideal tools for sizing joints as well as producing dowels. 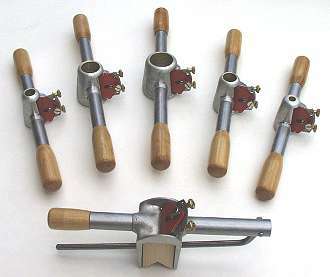 The trapping plane can be used to shape and taper the cylindrical lengths produced by the rounders.